God-given dreams are a wonderful thing. But so often, the dreams take time in coming to fruition. In the in between time, detours and disappointments seem to line the pathway. How will we handle the detours? Will we get bitter or get better? Will we give up or remain faithful? In this powerful seven-message series, Pastor Jeff Schreve shares life-changing truths from the life of Joseph to help us trust God and stay faithful to Him, regardless of the setbacks. This series also includes a special bonus message by Gov. 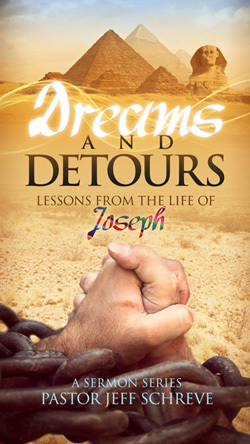 Mike Huckabee, in which he shares how the Lord used the detours in his life to lead him to destinations full of blessings and a closer walk with God.